In the spring of 1963, Hugo Freed founded the now-prospering Malibu Orchid Society. Hugo Freed, a well-known orchid hybridizer and lecturer, was the general manager of Arthur Freed's Orchids, operating since 1946 on Bonsall Drive in Malibu. Hugo's brother, Arthur, was the famous Hollywood producer of musicals. Orchid societies were relatively rare at that time, and the consensus was that it would be difficult to organize an orchid society in Malibu. However, the Orchid Society of Southern California had existed for some time and orchids were gaining in popularity. Furthermore, when the American Orchid Society held the 4th World Orchid Conference in Singapore, it decided to award the 5th World Orchid Conference to Long Beach, California, in 1966. For that event, the Southland Orchid Show Committee was founded, representing all southern California orchid societies. Much support needed to be in place for the conference and since Hugo Freed was already involved through attendance at some of these World Orchid Conferences, he was motivated to start the Malibu Orchid Society. Not long before then, about a dozen people had begun to meet monthly in Hugo Freed's office to discuss orchid culture. That group became the nucleus of the Malibu Orchid Society. The charter members were Don and Madalene Fobert; Hugo and Ella Freed; Clarence and Gladys Harter, Anthony and Vivian Mikulec; Frank and Maxine Millington; Randolph and Gertrude Moultrie; Revelle and Jean Nelson; Amado and Maria Vasquez; and Dwight and Margaret Wilson. Amado Vasquez was then the head grower on the Freed Orchid Range. Madalene Fobert, Hugo Freed's secretary, served as the membership secretary for twenty years. Hugo Freed and Revelle Nelson served as the first and third presidents of the MOS, respectively. After operating informally for six years, the Malibu Orchid Society incorporated in June 27, 1969. The directors named on that document were Paul Dorn, Bill Gaylord, Gladis Harter, Patricia McGovern, Anthony Mikulec, Revelle Nelson, Helen Pastution, Gladis Rosenke, Rosemarie Reed, and Dwight Wilson. Board meetings were rotated between private homes, much as we do today. Some social functions, such as picnics, were held on the large grounds at the end of Bonsall Drive, where the Freed nursery was located. Hugo Freed retired in 1974 after managing the Orchid Range for 28 years. He sold the firm in 1978 to Amado Vasquez. Amado called his new firm, Zuma Canyon Orchids, with his son George in charge of the sales operation and his wife, Maria Vasquez, in charge of the lab. At some point during that period, the range was moved to its present location, still on Bonsall Drive, but somewhat closer to the ocean. From then on, the Zuma Canyon range was used for society picnics in summer, and many interesting parties were held there. To the MOS members who have joined in the past six or seven years, the society must seem like a reasonably stable organization, with meetings and events held in familiar places. But it was not always so. During the first couple of decades, the MOS held meetings and events in a variety of places. During much of the 1970s, regular monthly meetings were held at Webster school in Malibu. Some time in the early 1980s, the meeting venue was moved to the Malibu Sea Lion Restaurant. Does anyone remember the Sea Lion Restaurant, with a tank of live sea lions in the parking lot? Today the sea lions are long gone and the place is named Duke’s Malibu. This arrangement lasted until early 1986, when the restaurant closed for remodeling, and the MOS moved to the community room at the Malibu Civic Center. After only three months at the community room, the meeting venue was moved once more to the Pt. Dume Community Center, with this arrangement lasting about four years, with a return back to the Malibu Civic Center in early 1990’s. Administrative changes by the Civic Center management led to logistic difficulties, and in early 1993, an arrangement was reached with the management of the "sea lion" restaurant, by then known as Charlie Brown's Sea Lion Restaurant (however, without the sea lions). Part of the deal with Charlie Brown's was that some members of the MOS would have dinner there before the meeting. This might have been the origin of the practice of pre-meeting gatherings for dinner, with this apparently working to everyone's satisfaction until the spring of 1996 when the restaurant was sold and closed for remodeling. It was at this point the society moved to the Pacific Palisades Women's Club, where we have been meeting since then. Before orchids became a commodity sold at every grocery store, those exotic plants were publicized through orchid shows. One of the earliest in Southern California was the Santa Barbara International Orchid Show, established in 1945. 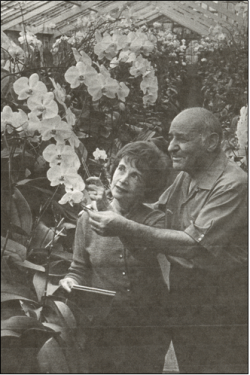 Helen Pastushin, an accomplished orchid grower and early member of the MOS, designed the MOS entries in the Santa Barbara show during the late 1960s and all through the 1970s. In the mid-1980s, Georg and Gerlinde Stelzner moved from the San Fernando Valley to Malibu and joined the MOS. Gerlinde had been designing displays for the San Fernando Valley Orchid Society for several years, and soon became involved in similar endeavors for the MOS. Since about 1985, Gerlinde has been the chief designer of MOS displays at several different orchid shows, including the annual Santa Barbara orchid shows and similar shows held in the New Otani hotel. The organization of our monthly meetings has changed very little in the entire history of the society, but there have been quite many changes in the way the meetings were described and documented. During the first couple of decades, the meetings began at 7:30 or 7:45 PM and consisted of a main speaker, plus the plant forum with ribbon judging, a raffle table, a silent auction, and refreshments provided by members. These meetings were recorded much more extensively than today. Some records, provided by Mary McEdwards, show that for at least some time in the early 1970s, extensive notes were taken on the speaker’s lecture. These notes, typically ran to several pages of typescript, and provided an excellent compilation of practical information on orchid culture and the characteristics of different genera. The extensive notes provided a fascinating insight into the effort that members devoted to the MOS during this time. One longtime member also noted that there were usually enough plants on the raffle table so that everyone came away with at least one prize. As the membership grew to 30 or 40 people, this practice became impractical. Another difference was that, in the early days, each newsletter devoted considerable space to recording the events of the past meeting. During the mid-1980s, the bulletin would list every plant on the plant forum table during the previous meeting, who had grown the plant, and occasionally some notes on how it was grown; of course, the results of the judging were included with some eight to ten awards made at a typical meeting. Unfortunately, lavish documentation of meetings gradually declined and would be very difficult to recreate today. The only difference between today's meetings and those of the past was the introduction of a culture session started by Cheri Hunter when she was president in 1995. At the same time, the meeting start time was moved up to 7:00 p.m. Red Marsh gave the first culture session on staking and repotting. The culture session has proven to be a popular component of our meetings.